Promotional product samples are a great way to try a product before buying it. Place an order for the promotional Augusta Sportswear 4380 Brushed Tricot Tri-Color Jacket! Available Sizes: Adult: S-3XL. Youth: S-L, No Charge for 2XL Upsizing! Add $3/each for 3XL sizes or higher. Upsizing charges are not calculated during your online checkout, we will notify you of the additional upsizing charges when you receive your artwork eproof. Mix & Match Apparel Colors: Mix and Match your apparel colors for the same style number, as long as there are no artwork changes or decoration color changes. Specify your mixed garment colors and sizes in the special instructions or contact customer service for a custom quote. Imprint Area: 4-inch Diameter. Price includes up to 10,000 stitches, most logos are less than 10,000 stitches, if you are worried Request a Stitch Count of your artwork. If your logo exceeds 10,000 stitches we'll notify you with your art proof. Shipping Weight: 6 units at 7 lbs. No Free Rush Available. A Paid Rush Service is available when our production facility is not at maximum compacity. Please contact us before ordering if you are in need of a rush order. Rush Fees are: 6-8 Working Day Production for $1/each garment, 4-5 Working Day Production for $2/each garment, 3-4 Working Day Production for $3/each garment. Rush orders must be verified and placed by phone. Be The First To Review our Promotional Augusta Sportswear 4380 Brushed Tricot Tri-Color Jacket at The Executive Advertising! At The Executive Advertising we offer tons of great promotional products like our Promotional Augusta Sportswear 4380 Brushed Tricot Tri-Color Jacket decorated with no setup fees! Customized Augusta Sportswear 4380 Brushed Tricot Tri-Color Jacket Embroidered with your company logo, team or school name. Promotional Augusta Sportswear Zippered Athletic Jackets are customized easy online ordering and low minimums. If you need any help just contact our customer service staff at 800-338-7996. 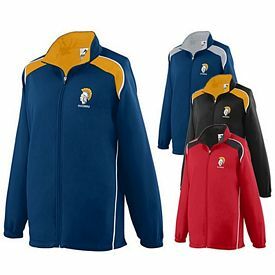 Popular Searches: Search Terms that got you to this promotional product are Promotional Augusta Sportswear 4380 Brushed Tricot Tri-Color Jacket, Customized Augusta Sportswear 4380 Brushed Tricot Tri-Color Jacket, and Augusta Sportswear 4380 Brushed Tricot Tri-Color Jacket Printed with Logo. You can also view our related products or categories to locate similar items to the Augusta Sportswear 4380 Brushed Tricot Tri-Color Jacket.